Friday, April 12, 1963, Town Hall, New York City. Where were you? I wasn’t yet born, but since you are reading this newspaper, then I can safely assume that you were probably born, if not already in your 30s. So, where have you been my darling old one? Look where we are now. Tuesday, October 18, 2016, Malta. Living an economic wonder of congestion, construction and corruption. Getting fat, sitting, waiting for the hard rain to fall. I watched the Budget speech… tried to… Quickly bored I began zapping through the local channels: TVM, Net and One and again TVM, Net and One, and again, and again, the voice of Minister Scicluna in time gaps, the all-suited male panel on Net, quick angles of red-eyed MPs, it was a vicious cycle, one quite hard to break. I settled on TVM. Within five minutes, probably less, I zoned out. It happened a number of times until I was about to sleep…I would be damned if I slept to the voice of Edward Scicluna, quick switch off the TV! At that moment I understood Minister Scicluna’s rare political talent; he is boring. He may be intelligent, but his political strength is his ability to bore the masses. Lauded lies and whispered truths may be a politician’s modus operandus. But the opening of the government’s yearly Budget is something unique; a closely followed parliamentary speech that is not delivered by the Prime Minister or the leader of the Opposition. 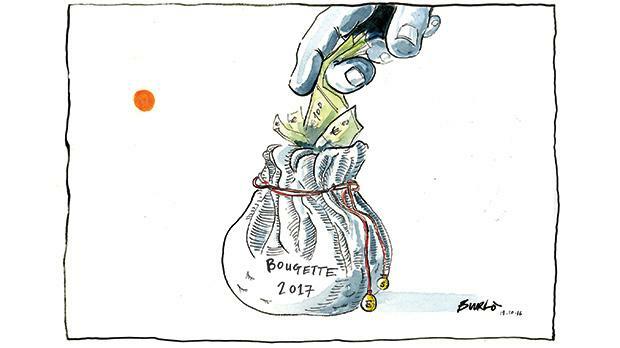 It is the Minister of Finance who hands out the yearly fiscal forecasts from his little bag (bougette). Your personal finance and stuff is hard enough to digest, let alone that of a nation. Yet it is important and should be easily understood by people, but do they understand it? Because I don’t, especially when the information is being read by Minister Scicluna’s hypnotising voice. Therein lies his political talent: he takes information of national importance, which in itself is already boring, and he turns up the boring. And we the people don’t do boring, not when there is the next episode of Narcos you want to watch. Whether or not he wields the Sith-Power of boredom willingly, it works; I was disinterested. The boringness of it all. The bored faces of other MPs, phubbing, picking, jeering, pounding, in their limestone cavern, it appealed to my apathy. This stuff doesn’t change either way, we’re all on the gravy train, and they’re laying the tracks, whichever way they see fit. To say that the Budget was a bit, bleh, is an understatement. The media reported that the Budget was bleh. Both the GWU and GRTU said “Bleh…” in different tones. Bigger cruise liners, more tourists, what’s best for Air Malta, upped prices on detergents, toiletries, tobacco, alcohol, soft drinks, concrete, steel. Road works, more road works, car-pooling, random bike racks, quick-fix public transport gimmick, a laughable fuel decrease, underwater tunnels, underwater connectors, property incentives in Gozo, another Mattia Preti… bleh! More of the same; the same taste of dust in the air, the same taste of exhaust through the window and the same taste of fish farms in the sea. “Maaaa how negative ta, on a Sunday,” you say. Don’t forget I’m writing on a Tuesday. It is useless for me to cry out, we need something better, something more. What’s the point of me writing about a bespoke infrastructure, a master plan tailored for the needs of the Islands of Malta, these gems we call home. It feels useless. Can’t we have a uniquely Maltese public transport system? More ferry connections, smaller buses, bus shelters, bicycle priority in village cores, suspended gardened bike highways, government or privately owned electric bicycle silos, a monorail or an underground, whichever suits our needs best, cheaper taxi services, Uber, and no horse-cabbies? A mix-and-match solution, where you catch a bus from Mġarr to University, hop on a peddle-assist bicycle, cycle to Valletta, or Sliema, board an express ferry from Pietà to Gozo. To be fair, we currently have a uniquely Maltese energy situation. Involving China, Gasan, Panama, a minister without a portfolio, fossil fuels, and a frightfully large LNG tanker called the Armada, which as I type is attempting to dock at our shores. As national situations go, this is as Maltese as it gets. What could go wrong? Another Preti? Hold on tight “my darling young one”, il-ġid se jasal.